Heard today that a new social media site, ViewPoints.com, has just come on line. 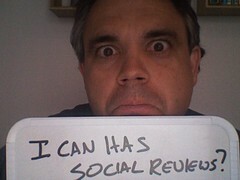 Like all good new social media sites, this one has a focus and is breaking into relatively new territory: Social Reviews. The concept is simple to anyone who has ever created a profile on any social media site, so I won't belabor that point. What I will rave about is their use of the "I am" tags, which is simply brilliant. When filling out your profile, they give you the chance to choose several statements about yourself in different context. In the "About my Work" category, you can say that you are a movie star, a college professor, a CEO... lots of different choices. Think you have one better? Add your own tag. Then do that about 20 more times and you've developed quite the tag repository about yourself. Armed with that information, the system then suggests tags to you that may be relevant to the reviews that you are writing. How cool is that! Very helpful to others who are reading your review to help them understand if you are the same type of person that they are. All and all, I found the site easy to use and friendly. Looks like a lot of thought was put in to this one, and I think they'll do well. Heck, I've already created my first review.